I love how the cocktail world can't decide whether it should be retro a la Mad Men or contemporary a la mini-slider type menus so in recessionary vogue. I had an amazing Old Fashioned recently at the Bryant Park Grill, made with Jack Daniels and just the right amount of muddled fruit--a sweetish version that was at once satisfying and surprising. 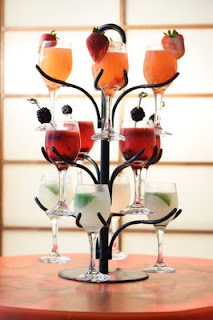 At the other end of the spectrum, SushiSamba has introduced their cocktail tree where you can choose up to 3 flights of cocktails for each of your friends from their extensive menu. And it's beautiful, too. In Search of the Perfect Lobster Roll... Again! It's Sunny in New York. OMG! Where Can I Hide? A Vacation on Two Feet?